Manufactured in Grande-Bretagne from 1978 until 0. 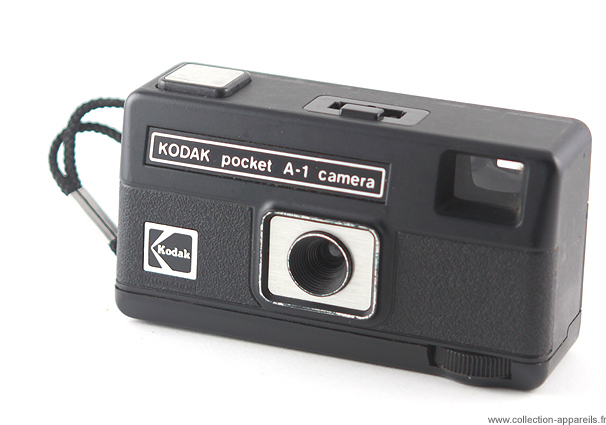 Pocket A1 and its variants do not have at all the usual form of the 110 Kodak. Impossible to know why the design office launched such a form. A1 was manufactured in Great Britain from 1978 to 1980, before to be famous “Brownie” until 1982. There was a promotional version named B1. A1 exists in two variants; one with a yellow shutter release, the other with a metallized shutter release (as well as the circumference of the lens). These cameras were sold with an “ever ready” case, made of rigid plastic.They had only the 1/50 secondes, the lens being one 11/25 mm. For the small history, this camera left at the same time as Canon….A1.